If you remember playing hockey at school and loving it, perhaps it’s something you’d consider taking up again as an adult? It’s a fast-paced team sport of 11 positions, combining both defensive and offensive elements. It helps to have good cardiovascular fitness, flexibility and agility but all that can be worked on and improved. There are three types of position – offensive, defensive and midfield. The offensive players normally sit on the right and left wings with the centre forward or striker in a more central position. The midfield players are situated on the inside right and inside left and in the centre half of the pitch. They move about the field, linking with both the defence and offense. The defence includes right and left halfbacks, two fullbacks and the goal keeper. These players will usually hold their field positions. The halfbacks will normally focus on wide strikers and wingers, while the fullbacks will normally remain in the defensive part of the field, perhaps venturing in the midfield if there is opportunity to do so. The goal keeper stays in the goal circle and this is the only place where they can use their body to play the ball. The goalkeeper will usually stay within the goal-circle, which is the only place they are allowed to use their body to play the ball. Once they leave the circle, they must only use their stick. Their aim is to prevent the ball crossing the goal line. Also known as centre forwards, a striker must be able to shoot goals, have quick skills with the hockey stick, be fast and athletic. A striker must shoot the ball at goal with either foot being dominant and with the forestick side or the backstick. Playing in midfield involves the ability to shoot, dribble, mark and pass well. It is one of the hardest positions in the modern game with a lot going on and quick decisions to make. Keeping the opposing team away from the goal circle is the main objective of a defender. When tackling, it’s important to stay out of the goal circle area or a foot or stick check could result in a penalty corner for the opposition. You’ll need speed and strong skills with the stick. This is the most unique position on the field. 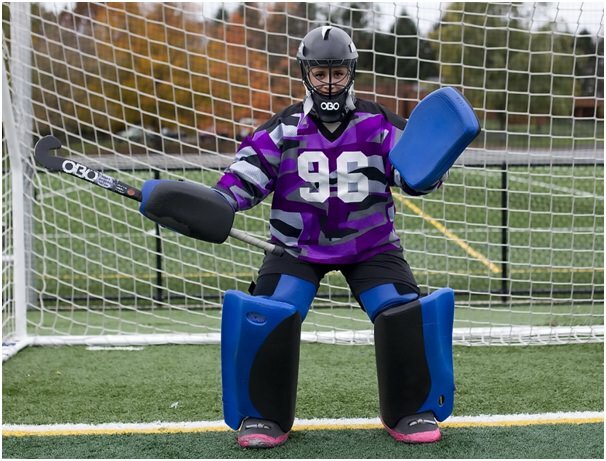 The goalie is the only player to be restricted on where they can move, and the only ones permitted to use their body to play the ball inside the goal circle. Goal keepers need quick speed from a standing start, flexibility, great hand-eye coordination and the ability to hold one’s nerve! Even through the padding and headgear, a ball still hurts when it hits.